Your horse’s health is the reason for Stiefel’s 30 years of success Recommended by veterinarians and therapists Starting with our very first supplement, our goal has been to enhance the performance and vitality of our customer’s horses. Through collaborative efforts with veterinarians and therapists together with our many years of experience, Stiefel products have been adapted to meet a horse’s needs. A family business with a passion for horses We produce innovative supplementary feeds and care products for horses. Our products are developed according to the latest scientific research and have found wide popularity on the equestrian market. Stiefel is built on high-quality resources and sustainability Stiefel stands for quality products with state-of-the-art manufacturing. We select raw materials that come from sustainable cultivation and are free of genetic modifications. 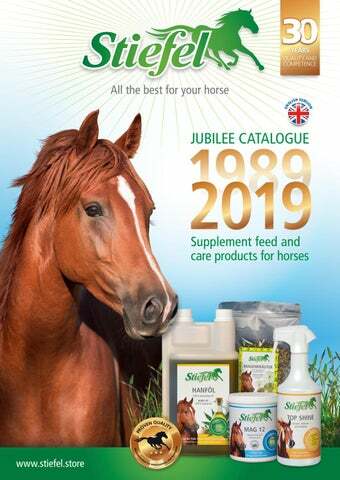 Stiefel is a youthful, energetic brand Our business started in 1988 with Innopha feed supplements and care products. Since 1989, our products have borne the name Stiefel. Are you a horse enthusiast? Then you’ll also be enthusiastic about our high-quality products and our young team. 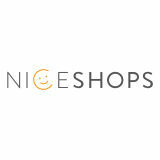 Get to know us through retailers, our online shop, or at trade fairs. We look forward to seeing you! NOTE *Feeding recommendations in the catalogue always apply to large horses with a body weight of approximately 600 kg. The daily ration should be individually calculated. Stiefel Broncho Plus NOTE When feeding food supplements, the current anti-doping directives of the FN should always be taken into account. More information at www.pferd-aktuell. de. We accept no responsibility for any changes that may have occurred by the FN. STIEFEL GUARANTEE We verify the quality of our products and use only carefully selected materials. Our products are recommended by veterinarians and therapists. STIEFEL QUALITY CARE Stiefel Acute Lotion STABLE PHARMACY Products marked with this symbol are recommended by us for a well-stocked stable pharmacy. ISO 9001 Our products are ISO 9001 TÜVCertified and form the basis of our high-quality Stiefel-products. HORSES IN SPORTS Sport horses must fulfill special requirements and therefore need a higher amount of essential vitamins and trace minerals. That’s why we want to give our sport horses the best possible feed for performance enhancement. Factors one must consider include power and endurance, but also a horse’s mental well-being. It is an enormous mental achievement for a horse – a „flight animal” – to remain fully concentrated on its rider and stay focused during an event, for example a jumping competition. Naturally, optimum performance is obtained through proper training, but can be enhanced through adequate vitamins and trace minerals. Vitamin E (tocopherol) is a fat-soluble vitamin. It mainly acts as an anti-oxidant, protecting cells against acidic substances and preventing their destruction. Vitamin E improves the oxygen supply to the muscles, thus increasing the horse‘s performance. Vitamin E should always be generously provided for high performance and sports activities. A vitamin E deficiency can lead to a drop in performance, muscle problems and tension. BALANCING OUT FLUID LOSSES A horse weighing approximately 600 kg will produce up to 35 litres of sweat within five to seven hours on a hot day if it is working hard. This amounts to approximately 7% of its body weight. Included in the horse‘s sweat, in addition to water, are considerable amounts of sodium chloride (salt), potassium, calcium, magnesium, phosphorus, zinc, iron and copper. Under extreme conditions, this may amount to several hundred grammes a day. In addition to the water lost, these electrolytes need to be replaced as quickly as possible. If the horse sweats frequently and strongly, a salt lick alone will not suffice. Recommendation: a diet containing a lot of roughage in the form of meadow grass and especially hay binds water in the intestine, thus constituting a hidden reservoir for hot days! We ride our horses and therefore make particular use of their muscles. Nature has not designed the body of a horse to carry humans on its back. This is why it requires special training and a balanced supply of nutrients to the muscles in order optimally to prepare the horse‘s body. If a horse has recurrent muscular problems such as tension, insufficient muscle build-up, hardening, etc. this may be due to various causes. The problems may either be caused by external factors such as a poorly fitting saddle or there may be physical causes. There are many treatment methods these days to cope with such problems, including physiotherapy or osteopathy, it is also recommended to activate and support muscle metabolism via the horse‘s diet. SUMMER ECZEMA: MORE SUCCESS WITH TRIPLE TREATMENT The skin is the horse‘s largest organ. Our horses often suffer from skin irritations such as summer eczema. The horses are tormented by itchy skin and summer eczema should thus be treated as quickly and comprehensively as possible. This not only includes insect protection and skin care, but also a controlled diet for horses suffering from eczema. body surface. A particularly effective method is the application of a spray and gel combination: The RP1 spray covers large body regions with a mist. RP1 gel is used for body parts that are either difficult to reach with the spray or that would required too much consumption: ears, the area around the eyes and especially the stomach. When applied with a sponge, the active substance will be applied in high concentrations exactly where it is needed most. Spray + gel = optimal protection with minimal consumption. GENTLE SKIN CARE. Dry, cracked skin constitute a gap in the horse‘s defences. Stiefel Eczema Protect is a gentle care lotion that restores moisture to the skin. The lotion becomes more effective when massaged deep into the skin. Protective and revitalising active substances can ensure rapid regeneration of the skin and promote wound healing and the formation of new tissue. CORRECT FEEDING. Feed that is too energy-rich may place a strain on the large intestine and negatively affect metabolic processes. A possible consequence: a lack of vitamins and zinc in the skin, which favours the symptoms of summer eczema. In the same way, the skin is much stressed during the period when the horse changes its coat, this requires a lot of zinc and vitamin B, thus weakening the skin. Unfortunately the coat change season is directly followed by the blackfly season. This means that the skin of more sensitive horses would often not stand a chance without some assistance. Such a deficiency adversely affects the structure of the skin - the cells lose their elasticity and moisture, while the production of new cells slows down. However, when trace elements and vitamins that are important for healthy skin are supplemented, the reserves are topped up and the skin is strengthened from the inside. Stiefel Diatomite is rich in zinc and vitamin B and is fed to the horse to balance out deficiencies. It also ensures a good water balance in the cells and promotes cell metabolism. Inflammatory products are more rapidly removed and the skin is „cleansed“. Another rich source of vitamin B is Stiefel 100 % pure Brewer‘s Yeast. In addition, Stiefel Black Cumin Oil can reduce allergic reactions and stabilise skin functions. The horse’s hoof is an anatomical phenomenon. A horse basically stands ‘on toe’, like a ballerina, 24 hours a day, thus the adage ‘No hoof, no horse’. It’s also a fact that good hoof quality is a prerequisite for a healthy, happy horse. A poor hoof position or inferior hoof quality can quickly lead to negative effects over a horse’s entire body. The hoof has its own mechanism which is developed through movement, as the hoof capsule expands and contracts through the placement and lifting of the foot. This movement pumps blood into the hoof and back to the heart. This process, like metabolism, is part of a horse’s circulatory system. This underscores the important role of the horse’s hoof and why good hoof quality is essential to good health. Hoof quality depends on the proper care, feeding and treatment of a horse, as well as how it is kept and used. Trush is mostly caused due to humid or muddy subsoils. When the hoof is soaked and soft, germs and bacterias can easily penetrate the horn. The rotten parts need essential treatment, so the germs cannot cause further illness. It is important not only to clean the hoof from the outside but also to strengthen the immune system of the horse from the inside. Heat will loosen muscle tightness caused by one-sided strain or compensation. A build-up of lactic acid means that the muscle cannot „breathe” properly and will cramp. The muscle lacks sufficient oxygen, and muscle metabolism is disrupted. This can be prevented through the application of heat. Stiefel Mineral Paste and Stiefel Suspenat are both ideal for heat application, for example for tight back muscles or loins. Ideal for all types of bandages. The cotton wool comes with a gauze layer, preventing any formation of unhygienic fluff. Previously Hoof Protect. Deep penetration into the frog cleft has a conditioning effect while maintaining breathability. Protects sensitive skin areas and supports damaged parts of the skin with natural herb extracts. For tendons and joints following hard exercising of legs during training and competitions. The natural ingredients have a cooling, revitalising and refreshing effect. ALU SPRAY · Skin protection Protect the wound from harmful bacteria or dirt particles. BLUE SPRAY · Sanitiser Sanitizing spray for cleaning and disinfecting stables and riding accessories from bacteria, viruses and fungi. Concentrated herb extracts can provide relief for respiratory pathways and bronchial tubes during rearing- and feed-related respiratory path problems. MINERAL PASTE · fitness for horse legs To be applied to stressed tendons, muscles, ligaments and joints. VET-BANDAGE A self-adhesive bandage for rapid wrapping or fitting of bandages. Adhesive effect prevents slipping. ZINC SPRAY · for skin care A skin-protecting spray-on cream with zinc to protect problem skin. Drop us a line ... We the Stiefel team are pleased to hear about your experience with our Stiefel products. Here is a brief excerpt from the reports we have received. You would like to share your experience with us? Please send us an Email to info@stiefel-net.de or post us a comment on our facebook: Stiefel – all the best for your horse. We are looking forward to your message! HERB GARDEN GOOD THINGS FROM THE HERB GARDEN Herbology is one of the oldest forms of human medical knowledge. Herbs constitute nature‘s pharmacy: They strengthen the immune system, stimulate the body‘s self-healing properties and can prevent diseases. Wild horses instinctively know which plants will help them. However, our cultivated horse meadows usually contain very few types of plants, which means that using herbs as a feed supplement is useful in many cases. There are herbs to treat many conditions, including cough, eczema and digestive problems. Moreover, herbs provide numerous phytochemicals to which horses have become adapted over millions of years, but which are often lacking in modern feeds. We use the healing power of herbs in our horse feed supplements! Many herbs are not only suitable for feeding horses, but also for external application. To make dressings, pour boiling water onto the herbs, allow them to draw for 10 - 15 minutes, then use them to fill the bandages. The herbs can also be placed onto compresses, which can then be saturated with hot water and applied to the horse. Herbs may be fed as a short-term treatment or the whole year around. The use of herbs for healing purposes may be very helpful, but will not replace the advice and treatment of a veterinarian in the event of an illness. We recommend that you always discuss the administration of herbs with your veterinarian when dealing with gestating mares and horses that are being treated with medication. Stiefel Hemp oil – A 100 % natural product that provides horses in all phases of life with essential fatty acids such as linoleic acid, alpha-linoleic acid, gammalinoleic acid and omega-3 fatty acids. Hemp oil is particularly beneficial for the coat and the skin. RESPIRATORY TRACT + IMMUNE SYSTEM If a horse is coughing, this usually means that the respiratory tract is irritated or diseased. There may be various reasons for this. Bacteria or viruses may attack the mucous membranes, for example. In addition, external factors such as dusty litter or similar factors may exacerbate coughing. If the horse is weak and lacklustre, it is recommended to measure its temperature and to consult a veterinarian. To calm the respiratory tract, we recommend the addition of herbal products and oils to the feed. In the same way, the immune system can be strengthened by adding certain herbs. However, the cause of the cough should also be investigated. MOBILITY + JOINTS Horses are elegant creatures. We like to watch them when they gallop across the meadow, full of strength and energy. Originally the horse‘s movement system equipped it to move slowly along for approximately 18 hours a day, looking for food with its head near the ground. When there is a need to escape, it is also able to put a high strain on its muscles and tendons immediately. To support the joints, cartilage, tendons and muscles, it is therefore important to provide our horses with sufficient opportunities to keep moving. It is only by providing the necessary nutrients and by constant movement that they can form sufficient joint fluid to supply the cartilage with minerals. Under heavy strain or in old age, the body no longer manages to transport sufficient nutrients to the joints. In this case, the body must be provided with a targeted food supplement. Willow bark and meadowsweet both contain the raw materials of acetylsalicylic acid (ASA). The active substance salicin was discovered in the 19th century and resulted in the development of synthetic painkillers for human use. Both herbs can act as blood thinners. Willow bark has a higher depot effect in comparison with meadowsweet. However, some horses prefer the slightly sweeter taste of meadowsweet to the bitter taste of willow bark. The skin is the horse‘s largest organ. This also includes its fur. If the horse has glossy, healthy fur, we can assume that it receives an adequate supply of minerals, trace elements and vitamins. Our horses often suffer from skin irritations, pruritus and even eczema. This can often be traced back to a nutritional deficiency. Zinc plays an important role in the metabolism of sugar, fat and protein and is required in larger amounts for the regeneration of damaged skin cells. However, if the body‘s entire metabolism is disturbed, this often manifests itself in the skin and fur. In this case we should like at the horse‘s complete diet. Any deficiencies of vitamins, trace elements and minerals that continue to exist for lengthy periods may also take a long time to replenish before improvements in the structure of the fur start to become visible. BIOTIN · FOR STRONG HOOVES Stiefel Biotin strengthens the hooves and the coat. It compensates for feed-related biotin deficiencies. A biotin deficiency can have negative effects on hoof horn growth. Elasticity and resilience can be affected. Stiefel Biotin is based on the highly effective triple formula biotin, methionine and zinc. The feeding should take place over a longer period of time (at least 9 months), since biotin can only become noticeable with the growth of new horny cells. NOTE: On average, the hoof grows 1 cm per month. Highly effective 3-fold formula: biotin, methionine and zinc. Feeding recommendation*:10 g per day (1 kg = 100 days) A daily dose contains 20 mg Biotin. Stinging nettle contains a high proportion of silica, which supplies the building block silicon. Silicon is next to zinc a very important trace element for the skin. It promotes the elasticity of the skin, because it accelerates the formation of collagen and elastin. If the skin is supple, it does not crack easily and is tougher against bacteria and germs. Which rider doesn't know that? It is not only horses and people who look forward to warmer temperatures – so do pests such as horseflies, blackflies and ticks. They all respond very strongly to smells. As it becomes warmer outside, both horses and humans increase their body odours and this attracts insects. Fly sprays do help, but they are also smelly and the smell tends to linger for a long time. cloud that may last for several hours and acts as a sensory repellent for the insects. Moreover, the active ingredient Icaridin is very skin-compatible and is also suitable for human use. Especially gentle for the skin is our new RP1 Repellent Sensitiv in combination with our proven RP1 Gel. Even stronger in its drug concentration is our new RP1 Repellent Ultra. A correct application promises a maximum benefit with a minimum consumption: it is very important that the repellents should be correctly and extensively applied – the maximum benefit at minimum consumption is achieved by combining the spray and gel. The Spray with its fine mist is able to cover the lager areas as back and hindquarters. The Gel covers the sensitive parts around the eyes, ears and stomach. Stiefel RP1 Repellent is available as Standard Spray, Ultra Spray, Sensitive Spray and Gel. THE STRONG 3 The active insect protection offers horse and rider effective protection for many hours - and without a smell! Maximum benefit at minimum consumption. It is very important to apply RP1 over the entire area – the combination of spray and gel achieves maximum effectiveness with minimal consumption. NOW NEW: RP1 Spray Ultra + RP1 Spray Sensitive! RP1 SPRAY ULTRA: Now even stronger! With even more intensive horseflies and tick protection for long-lasting protection. RP1 SPRAY SENSITIVE: For particularly sensitive skin types! Without alcohol. A great addition to the RP1 gel for sensitive horses. MINERAL MINERALS – TO IMPROVE THE DAILY FEED RATION A basic supply of essential minerals and vitamins is very important to keep our horses healthy. However, current breeding and feeding conditions unfortunately do not guarantee the correct mineral ratio. As all minerals interact with each other and reinforce each other, but may also block each other or even cancel each other out, minerals should be supplemented in the correct ratio. The following points should not be forgotten: Each horse is an individual. What is sufficient for one horse may be insufficient for another. Apart from the basic supply of essential minerals, each horse should therefore be individually considered and any deficiencies individually treated. METABOLISM METABOLISM Metabolism is the process in an organism of taking in nutrients which are then converted to energy in order to fulfil certain functions. Metabolism is controlled by hormones and the nervous system. However external factors like a horse’s feed and the weather can also have an influence on metabolism. The organ that plays a central role in metabolism is the liver. Horses evolved on the steppes, and their digestive mechanism and metabolism is geared to grazing on barren grasslands. Our pastures are often too lush and rich in nutrients for horses. This superabundance leads to an excessive supply of nourishment which in turn can cause laminitis or EMS, unfortunately common maladies these days. If metabolic function is derailed, the cause must be found and then the horse’s feed strictly controlled in order to get a handle on the problem. A horse’s metabolism can be aided through feed supplements. The metabolism of the horse is subject to particular stress, for example as a result of feed with an increased sugar content, medication, anti-worm treatments and many other things. Thus toxins accumulate in the body, which in optimal cases would pass through the liver and be eliminated by the kidneys. Horses should be regularly assisted with detoxification by stimulating and strengthening the body‘s own cleansing organ (the liver) by feeding herbs with bitters. A horse’s digestive process begins in its mouth, where its feed is crushed between its teeth and predigested through salivation. It then continues to the stomach where its nutrients are further broken down by gastric acid. From here it travels as „ingesta“ into the small intestine, where enzymatic digestion and absorption into the circulatory system occur. Crude fibre feeds such as hay, straw and grass primarily travel on to the large intestine, where they are handled by micro-organisms which transform this fibre into important fatty acids and vitamins. Horses are unfortunately quite susceptible to digestive ailments. These problems can often be remedied through targeted supplementary feeding. DID YOU KNOW? When a horse feeds on hay, up to 5 times as much saliva is produced as when it feeds on concentrated feed. This is why hay should always be fed before the concentrated feed, so that the stomach contains sufficient saliva. The saliva neutralises the stomach acid and thus prevents stomach irritations. PREVENT STOMACH PROBLEMS The stomach of a horse has evolved for continuous food intake because horses eat constantly. The stomach therefore continuously produces stomach acid. This is in turn neutralized by the flow of saliva while feeding on roughage. It is therefore necessary for sufficient roughage to be available and no long feeding pauses are created. Unfortunately, horses frequently have stomach problems ranging from gastritis to stomach ulcers. These may, for example, result from acidification of the stomach, which is caused when either too much stomach acid is produced or when it cannot be sufficiently neutralized. External circumstances such as stress, administration of medication or wrong feeding may cause this condition. Particularly sensitive horses should be supported with balanced feed in addition to sufficient provision of roughage. Veterinarian should always be consulted in cases of doubt. Amino acids are building blocks for a healthy life. Many body tissues consist of protein, an example are muscles, but also internal organs, connective tissue and skin, hair and hoof horn. Protein is produced by the body from 20 different amino acids. 10 of these are essential, which means that the horse cannot produce them independently, but must continuously take them up in its feed. If only one of these essential amino acids is lacking, for example methionine and lysine, this will adversely affect the formation of the body‘s own protein reserves. During their growth phase, horses required proteinoptimised feed rations. Lucerne provides roughage and is a very valuable supply of protein for horses. All information has been provided to the best of our knowledge and in good faith. Subject to changes in packaging, composition and descriptions, as well as errors in content, setting or printing. Reprinting – also of extracts – requires the written permission of Innopha GmbH. Further information may be found at www.stiefel.store.